From March 1466/67, her married name became Stewart. After her marriage, Margaret Ogilvy was styled as Countess of Buchan in 1469. [S323] Sir James Balfour Paul, The Scots Peerage: founded on Wood's edition of Sir Robert Douglas's The Peerage of Scotland (Edinburgh, Scotland: David Douglas, 1904), volume I, page 109. Hereinafter cited as The Scots Peerage. Marguerite de Bretagne was born in 1443.2 She was the daughter of François I de Montfort, Duc de Bretagne and Isabella Stewart.1 She married François II de Dreux, Duc de Bretagne at Clisson, FranceG. She died in 1469. 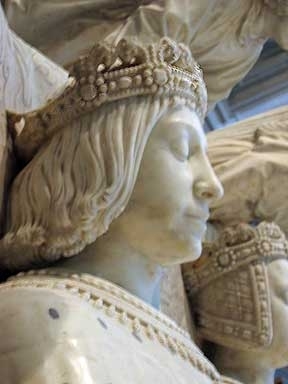 François II de Dreux, Duc de Bretagne was born on 23 June 1435. He married, firstly, Marguerite de Bretagne, daughter of François I de Montfort, Duc de Bretagne and Isabella Stewart, at Clisson, FranceG. He married, secondly, Marguerite de Foix, daughter of Gaston IV de Grailly, Comte de Foix and Eleanor, Reina de Navarre, on 27 June 1471. He died on 9 September 1488 at age 53. Katherine von Sachsen was born on 24 July 1468. She was the daughter of Albrecht I Herzog von Sachsen and Sidonia of Bohemia.1 She married, firstly, Sigismund Herzog von Österreich, son of Friedrich IV Herzog von Österreich and Anne von Braunschweig, on 24 February 1484. She married, secondly, Erich I Herzog von Braunschweig-Kalenberg, son of Wilhelm II Herzog von Braunschweig-Wolfenbüttel-Kalenberg and Elisabeth zu Stolberg-Wernigerode, on 29 June 1497. She died on 10 February 1524 at age 55. Alice Molyneux was the daughter of Sir Thomas Molyneux, 1st Bt. and Catherine Howard.1 She married, firstly, William Rogerson before 1727. She married Sir Richard Wolseley, 1st Bt., son of Richard Wolseley and Frances Burneston, on 5 May 1727. She died on 17 August 1778. From before 1727, her married name became Rogerson. From 5 May 1727, her married name became Wolseley. Child of Alice Molyneux and Sir Richard Wolseley, 1st Bt.